World War II | Out of the Box! Camels, Pyramids, and the Sphinx: A look inside a WWII scrapbook to celebrate Veterans Day! Veterans Day is Wednesday, November 11, 2015. Thank you to all our veterans for keeping American safe and free. 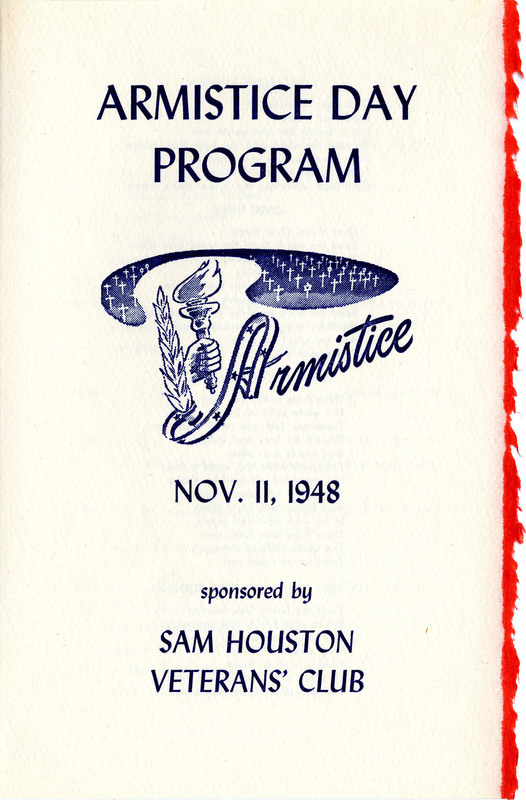 Sam Houston State University has a long history of men and women joining the armed services in times of war and peace. From the Spanish-American War to the current conflicts Sam Houston State students and alumni have always stepped up to do their duty. The above photograph and letter comes from a page out of a scrapbook of World War II newspaper clippings and photographs that relates to Sam Houston State Teachers College students, faculty, staff, and Walker County community members who served during the war. This oversize scrapbook has no information as to who gathered the materials or created the scrapbook. 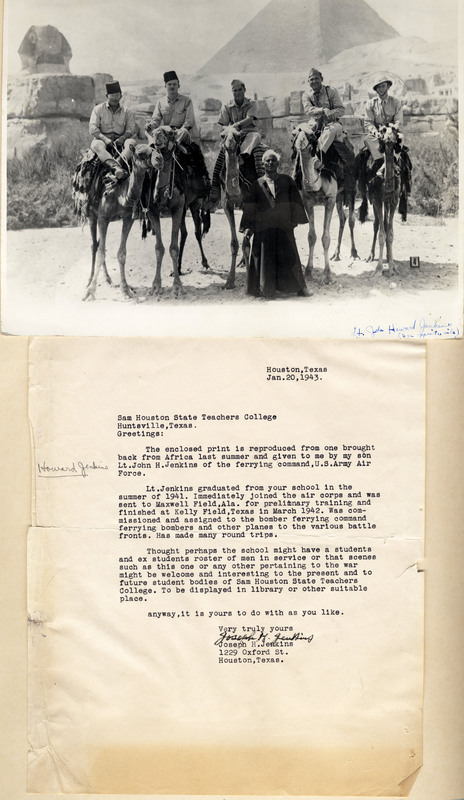 The young man on the far right camel is Lt. John H. Jenkins who graduated from Sam Houston State Teachers College in August 1941 with a Bachelor of Science degree. This photograph was taken in Egypt as evident from the camels, pyramid, and the Sphinx in the background. It too has an unknown date and photographer. To see more of this scrapbook and other items relating to veterans come visit the SHSU University Archives, room 400, Newton Gresham Library. The archives are open M-F, 8-5. The USO (United Service Organizations) Clubs in WWII were a major component of keeping morale up for those in the military, along with their dependents. From java hour, to wives craft club, to a class called Ball and Chain for military couples, to basketball at Paris Jr. College there was something to keep everyone occupied. 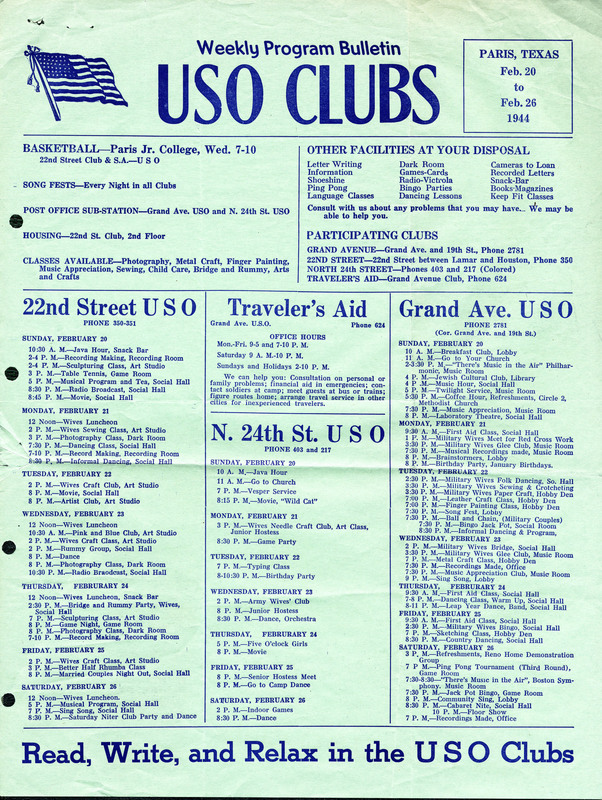 This 1944 USO Club program bulletin is from Paris, Texas. The bulletin is part of the Melvin Mason Collection. Dr. Melvin Mason taught English here at Sam Houston State from 1962-1991. In he was drafted into the Army from Roxton, Texas and sent to Chicago for training. WWII ended before he was sent overseas.